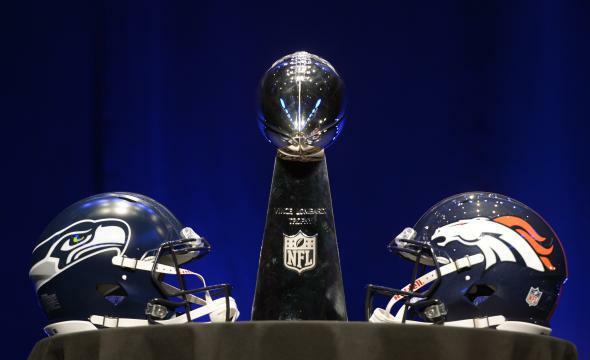 Super Bowl XLVIII forecast: It won't be as cold as in New Orleans in 1972. Here’s the Weather Map for the Coldest Super Bowl Ever. Hint: It’s Not This Weekend. Weather probably won’t interfere with the Super Bowl. For years now, there has been much hand-wringing and apocalyptic visions—including, horror of horrors, postponement in case of impending blizzard—centered around the forecasted weather for 8 p.m., Sunday, Feb. 2, 2014, in the New York City area. That’s because this weekend is the first outdoor Super Bowl in a cold-weather city since the NFL’s inception. Turns out all the fretting was for naught. The weather forecast couldn’t be much better for the big game. It’s not going to snow, it’s not going to rain, and it’s not even going to be very cold, considering the date and the incessant wallops of Arctic air that have been blasting the East all winter. The kickoff forecast of 42 degrees (courtesy of forecast.io) is cold, sure, when compared with an air-conditioned dome in Miami. But then, we wouldn’t have the charm of New Jersey to lure tailgaters. The forecast earlier in the week was for 15-25 mph gusts, but now it seems more like 10 mph, entirely more manageable for passers and placekickers and the like. I’m placing my bets now that this will be the most talked about boring weather forecast in history. However, had the game been played a few days ago, or a few hundred miles north, it would be a different story entirely. This weekend’s warm-up in New Jersey comes courtesy of a quick-moving snowstorm passing safely to the north of the stadium, which will bring just enough of a southerly breeze to create an insulating blanket of clouds and boost temperature a few degrees above normal. The air will be laden with humidity but much warmer than in recent days. The GFS model shows a broad swath of snow well north of New York City on Super Bowl Sunday—a safe miss. In fact, it’s probably not even going to be the coldest outdoor Super Bowl ever played. That honor will remain with Super Bowl VI back in 1972 in New Orleans, when kickoff was a chilly 39 degrees. 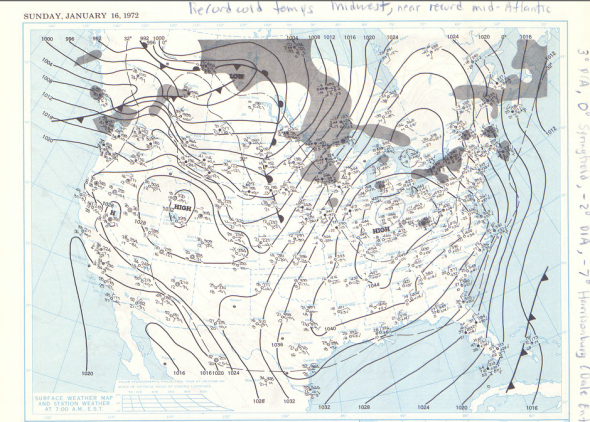 Weather map for the coldest outdoor Super Bowl ever played: New Orleans, 1972. The game was played during an outbreak of frigid Arctic air (not unlike this week in the South). Weather map via NOAA Central Library. The New Jersey state climatologist, David Robinson, has put together a resource on the historical weather for Feb. 2 at MetLife Stadium. It’s comprehensive in every sense of the word. What’s more, his website tracks the weather forecast in real-time and will watch the weather during the game. However, if the brief weekend respite from this year’s Siberian-quality winter is going to put you in snow withdrawal, you’re in luck. The weather pattern for the eastern half of the country remains very active, with at least two good shots for major storms over the next 10 days or so—one this Tuesday/Wednesday, and another possible storm next weekend. Twitter was positively alight with speculation this week over model that showed feet upon feet of snow blanketing the East around mid-February. Weather experts quickly debunked that specific forecast as a blip of noise in a vast symphony of possible weather outcomes: No weather model currently exists that can forecast snow accurately more than a few days in advance, let alone two weeks. However, the gist of recent model runs have been relatively consistent: Hunker down for a return of more snow and cold weather if you live east of the Rockies.